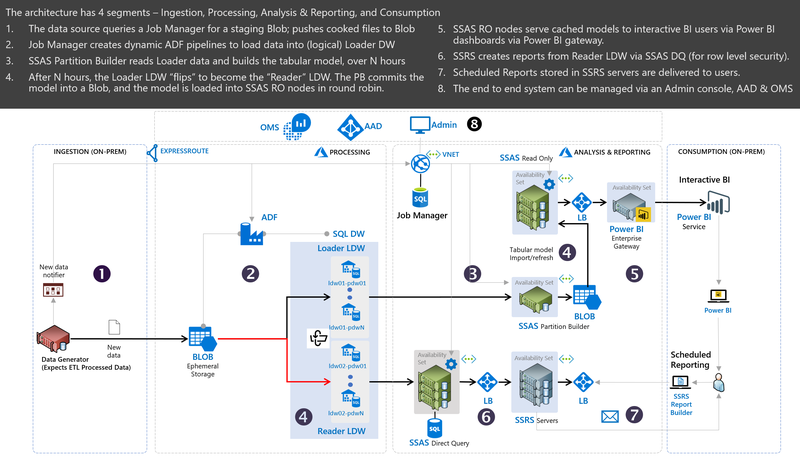 We are happy to announce the technical reference implementation of an enterprise grade infrastructure to help accelerate the deployment of a BI and reporting solution to augment your data science and analytics platform on Azure. Azure offers a rich data and analytics platform for customers, system integrators, and software vendors seeking to build scalable BI and reporting solutions. However, you face pragmatic challenges in building the right infrastructure for enterprise-grade production systems. Besides evaluating the various products for security, scale, performance, and geo-availability requirements, you need to understand service features and their interoperability, and address any feature gaps that you perceive using custom software. This takes weeks, if not months, of time and effort. Often, the end to end architecture that appeared promising during the POC (proof of concept) stages does not translate to a robust production system in the expected time-to-market. It is pre-built with components like Blob, SQL Data Warehouse, SQL Database, and Analysis Services in highly scalable configurations that have been proven in the field to meet enterprise requirements. It can be one-click deployed into an Azure subscription, to complete in under 3 hours. It is bundled with software for virtual network configuration, job orchestration for data ingestion and flow, system management, monitoring, and other operational essentials for a production system. It is tested end-to-end against large workloads. It will be supported by trained Microsoft partners who can help you with deployment, and post-deployment customization for your application needs, based on the technical guidance and scripts that ship with the solution. How do I get the reference implementation? In a nutshell, the deployed implementation works as shown in the graphic below. You can operationalize the infrastructure using the steps in the User’s Guide, and explore component level details from the Technical Guides. Review the documentation and deploy the implementation. For questions, clarifications, or feedback, please email azent-biandreporting@microsoft.com. You can also monitor any updates to this implementation from the public GitHub.